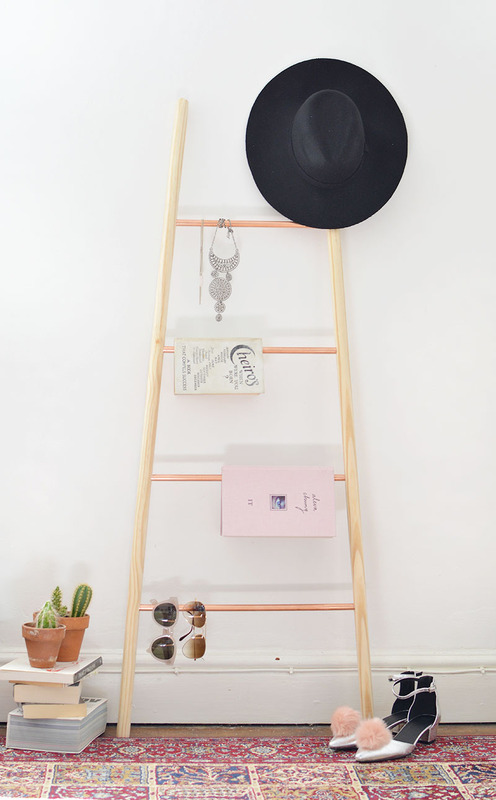 not all last minute things are meltdown inducing though- this ladder was a little DIY I made just before I threw everything into my suitcase, and it came out just fine! 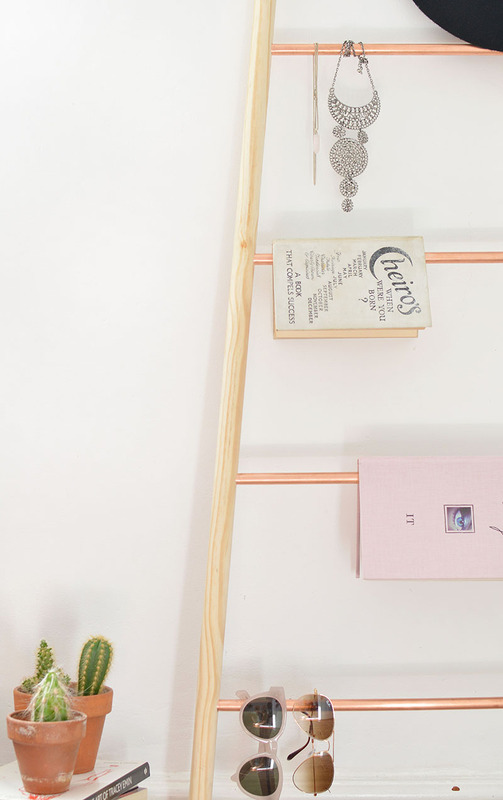 I was originally intending to make the ladder purely out of wood but as I was hunting for some wooden poles I spied the copper pipe in the plumbing section and decided to mix things up.. 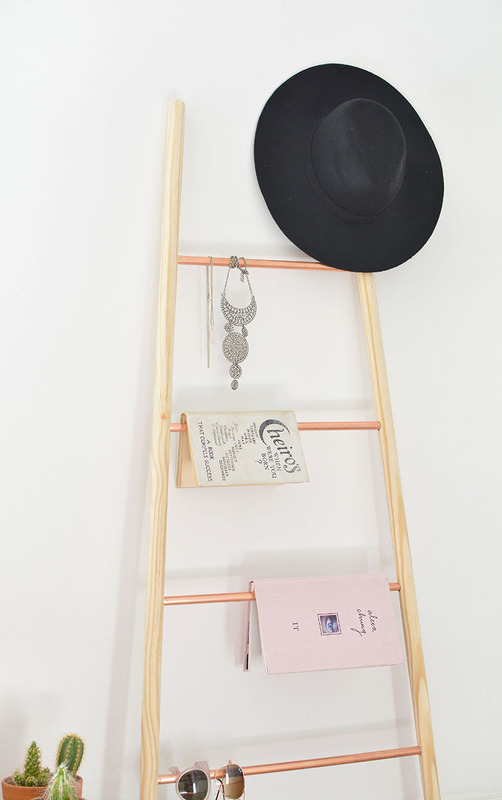 I'm always looking for new ways to display things and this ladder is perfect for displaying jewellery and smaller pieces, I guess it could also double up as a blanket ladder too! 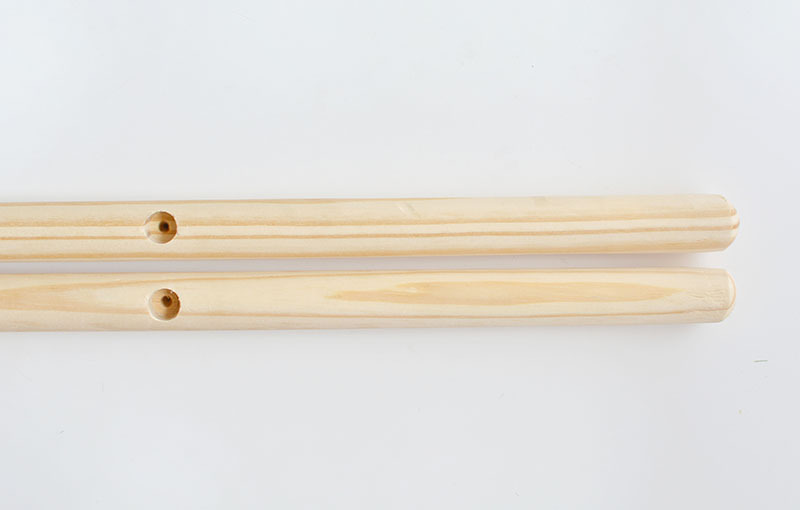 if you're tempted to give it a whirl read on for the how to..
first up decide how many rungs you want on your ladder- I opted for 4.
as I was having 4 rungs I drilled 4 x 17mm holes at 25cm intervals on my broom handle. repeat on the second broom handle. be careful that the holes are all in alignment or your rungs won't line up. to make my life harder I decided I wanted my ladder to be tapered so it's wider at the bottom. to do this I cut each copper rung 5cm longer than the one before. my top rung as 35cm, the second 40cm, third 45cm and the largest rung at the bottom was 50cm in length. 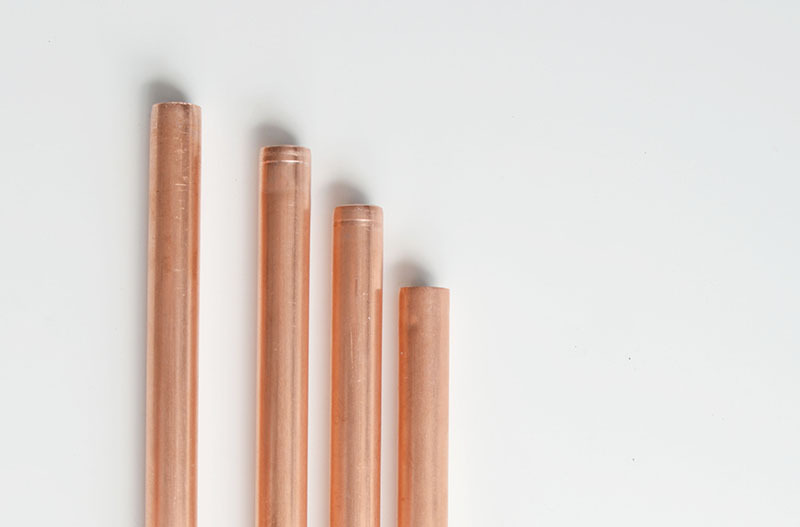 you'll need a pipe cutter to cut the copper to size. if you want an easier version just cut all the rungs to the same size to create a regular shape ladder! now comes the fiddly part- getting the rungs into the holes. you might find getting the bottom rung in place will pop the top one out so just keep wiggling and shouting at them until they're in place. 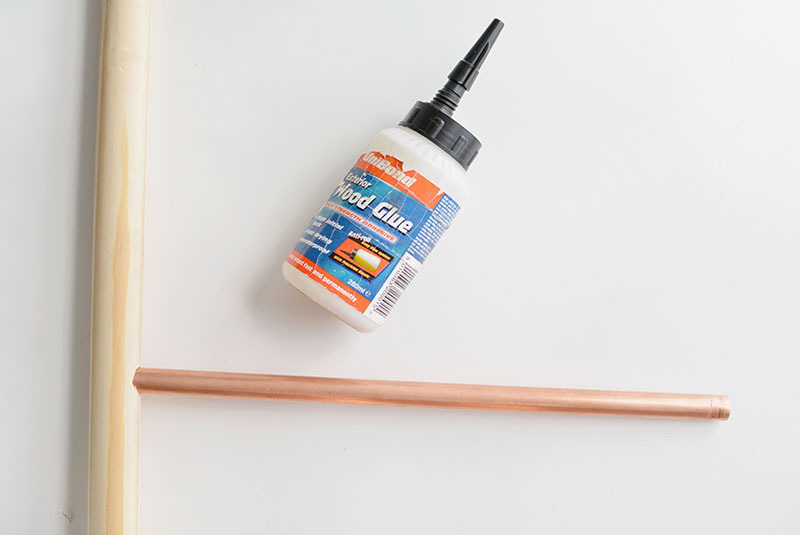 it's easier to lay the ladder parts on the floor and assemble them flat.. when you're happy glue the joints into place and leave to dry. 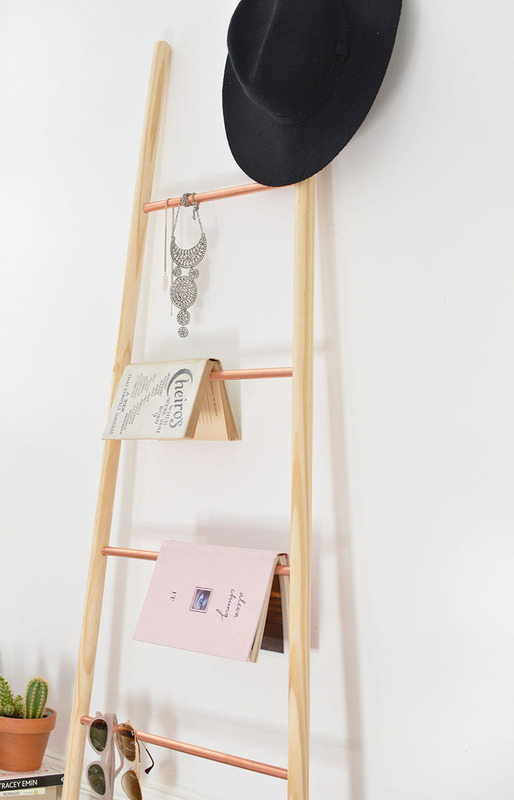 voila- one wooden and copper ladder! 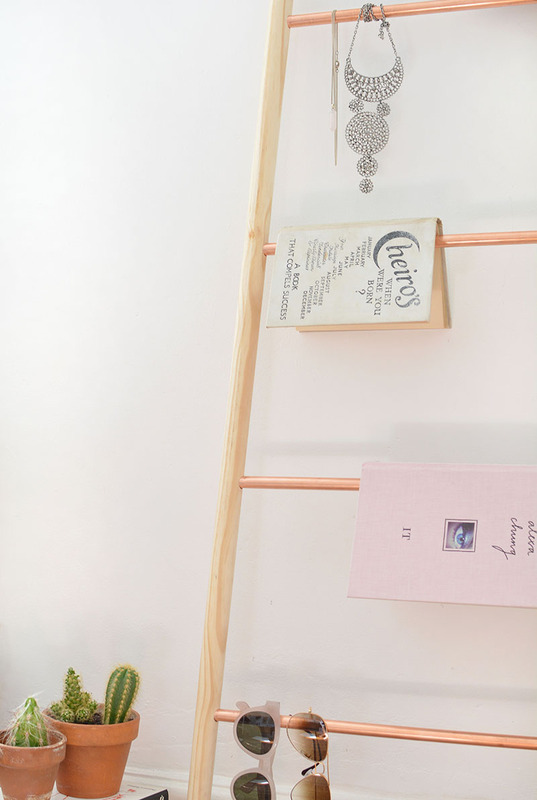 I like how dainty this is compared to my other ladder shelf which was aimed at holding bigger items like plants and books. I have drawers full of tangled chains and hairbands so I think I'll use mine mostly for hanging accessories like jewellery, scarves and sunglasses..
oh gosh this looks amazing! definitely saving this post and making this when i move into my new flat! Such a great DIY! Perfect! this is amazing! really cool idea. Those pom-poms on your shoes are amazing! Where did you get them?! Oh my gosh this is absolutely stunning!! I would love this in my house you could sell these! I would buy one haha :-) Bravo!! I looooove this!! And I love your wiggle and shout technique!! I loved! I am going to do it!